Here on the LEGO® Ideas team we are constantly being amazed by the LEGO® models that our members create and submit. Every year, out of the thousands of projects that are submitted, only a handful of them however manage to achieve the all important milestone of 10,000 supporters that moves their project into the LEGO Review, where models are presented to the LEGO Ideas Review Board to determine their suitability as actual LEGO sets. 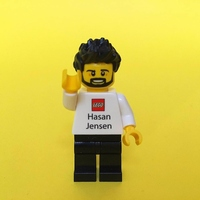 In the lead up to the LEGO Ideas First 2016 Review Results this fall, we would however like to do something new by taking some time to celebrate and highlight each member who, through a lot of hard work and determination, managed to gather the necessary supports for their projects to be considered in this review round. Today, we would like you all to meet Jessica Russell, better known as whatpumpkin on LEGO Ideas, the fan designer behind Fossil Museum. Learn a little more about Jessica, her project and her motivations. Help us congratulate Jessica on becoming a part of the LEGO Ideas 10K Club! I’m from Minnesota, in the United States. What I do for a living is slam frozen meat patties into a terrifying clamshell grill. However, in my free time, I do a lot of reading and research about dinosaurs. I draw and write, and play role-playing games like Dungeons and Dragons with my friends. My father gave my siblings and I some LEGO from his childhood when we were very young, which I suppose was where it started. However, what hooked me was two things, both of which came about in 2001: the LEGO Dinosaurs line, and the LEGO Bionicle line. I am completely enamored of the Lunar Limo. Its design is fantastic, breaking out of sleek, futuristic spaceship designs to instead make an absolutely ludicrous space mob boss limo, complete with red velvet interior. Its color scheme is attractive, its silhouette is memorable, and Brick Daddy is quite possibly the best minifigure ever created. As someone who builds primarily with LEGO Technic pieces, part 41677 has been invaluable to me. It is a true friend. I have many friends who build with LEGO who have each been an inspiration to me, but one of the most influential has been Patrick Biggs. He has a good eye for color, shape, and character. I frequent BZPower, though my activity there has waned. Most of the influential builders I know I met through there. I have had a scientific interest in dinosaurs since I was young, first watching the original Walking With Dinosaurs series. 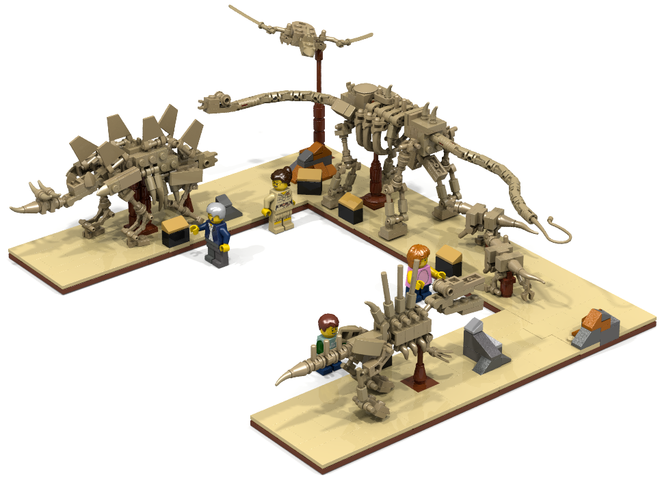 As such, I wanted to make a LEGO Ideas project that could showcase dinosaurs without relying on something like Jurassic Park, which would necessitate a sacrifice of scientific integrity, and instead could focus on accurately capturing their forms. As it turns out, skeletons are rather difficult to render in LEGO. In general, LEGO leans towards large shapes, rather than the small, slender bones I needed. I ended up using a lot of weird pieces to try and accomplish something approximately what I was going for, and I know in the end it’s definitely not up to LEGO’s standards of stability. I had the original complete in a few non-consecutive night’s work. After that, however, I continued to refine and tweak it when the urge struck, as the first pass at a design is rarely its finest. How did it feel when you reached the magic 10,000 votes? Honestly? It felt incredible. I was convinced several times that I was just dreaming an impossible dream. To have 10,000 people believe in my project, to believe in me… it’s an indescribable feeling. According to LDD, the final model uses exactly 668 bricks. First of all, believe in your project, and by extension, yourself. It’s cheesy, yes, but also incredibly true. For more down-to-earth advice, put in the work. Do what it takes to make something noteworthy. You don’t need to make something perfect right away, but it should be enough to make someone stop and want to take a closer look. If you’re trying to recreate something, do your research. Make sure your model looks like what it’s supposed to be. Push yourself and the bricks to their limits to make something incredible. As far as officially produced projects go, I am partial to WALL•E; that movie was a favorite of mine when I was younger. There have been many non-produced projects I quite enjoyed as well, especially the stranger ones that I knew would never be produced, but wished whole-heartedly could be. There was a strange mechanical-looking flying centipede that was built around a train track element, for example. It was beautifully strange. LEGO Ideas is an excellent tool with which to get something rendered as an official LEGO set that otherwise might never have been made. It’s resulted in such a fantastic outpour of ideas and concepts, ranging from the nostalgic to the esoteric, that otherwise may never have even been dreamed of as LEGO products. As for tips for uploading an idea, the most important tip is to make sure that your Idea is something you believe in. So long as it’s something you enjoy, something you want to see, that is enough. If enough share your vision, you may succeed. If not, there is never any shame in pursuing your passion.